We keep our calendar is up to date. For availability and a price quote, please click the yellow 'Book It (Get an Instant Quote)' button. You can confirm and reserve now, right online. We will then email you the check-in information. Please click the yellow Book It button after entering your dates to see the complete quote and check availability and reserve. Super convenient location to the best that North Scottsdale has to offer! Ideal private luxury house inside community walking distance to Basha's premium supermarket, restaurants, bank, and Walgreens. Inside Grayhawk, the Talon and Raptor golf course community of North Scottsdale and with access to the golf courses. Nearby, the Fairmont Princess Hotel/Resort, and some of the best restaurants (e.g., Barcelona, Mastro's steak house, Maggiano's, Capital Grill, Carlos Obriens, etc.). Luxury four bedroom Grayhawk beauty, loaded with high powered heated (104 degree) spa for eight persons, water softener system (for shower and cooking), fire bowl table with seating, pool table, large shaded back yard, misting feature for large patio, stainless steel gas grill, and pleasant birds. Outstanding outdoor features! A beautiful shaded oasis. Rare to find this much shade covering an entire large back yard. Also has a pleasant sounding 8 foot diameter water feature in addition to the spa. Inside, furnished with a super luxurious King-size bed with pillow-top, Queen-size bed, two single beds, and a Queen-size sofa bed. Furniture, beds, bedding, sheets, pillows, and kitchen/dining-ware are very nice. Two santa fe style leather couches and a matching super padded leather chair and ottoman for relaxing. Beautiful santa fe style southwest dining table. 30 inch wide-screen TV and DVD/VCR. Flat-screen TV also in master bedroom. High speed broadband wireless internet access. Cable TV with 50+ channels. Luxurious dinner plates and utensils for entertaining. Fire bowl table outside is large enough that eight persons can eat/sit around it enjoying a warming fire burning in the center. Garage parking for two cars, plus driveway parking for two cars. Please, no parking on street at night. Been coming to Scottsdale for business travel for years. Realized that the the desert sahuaro landscapes, resort like ambiance, and open space are extraordinary and unique among all locations we've ever visited in the U.S. and we just had to have a house here. We welcome our guests to share in our beautiful home. We had physically toured and evaluated over 100 homes throughout Phoenix and Scottsdale before settling on this particular gem. We found that Grayhawk is the #1 community for the combination of premium community, safety (private security patrols, N. Scottsdale location away from congestion and foot traffic on the other side of the 101), open space & walking trails, world class golf courses (Raptor & Talon), convenience (close to the best restaurants & shopping in North Scottsdale), family environment & top Scottsdale schools. The yard is particularly unique as it is the only house among the 100 homes that had a fully shaded back yard with great tree cover over the whole yard. So nice and cooler in the summer! Has a built in large fountain which is a nice touch with the sound of water. An occasional owl and hawk visits our trees too and have seen them right there over head! A good sized house too, with 3/4 bedrooms (4th has a pullout queen sleeper sofa if needed, and we use it as a reading room). Oh, so many unique benefits of this house in Grayhawk. We've mentioned many above. To emphasize, the central location to North Scottsdale activities is key, yet, away from the noise, car & foot traffic that is found around the restaurants and shopping areas. Yet, it is only a few minutes drive from those areas. Perfect. Also, when we want to pamper ourselves, the Scottsdale Princess Resort is only a couple minutes down Scottsdale Road, so close to us. The TPC course is at the Princess as well, so also a nice plus. Love it! Beautiful 8 foot square heated spa in the back yard. Fits 8 persons. House was great for our purpose: 3 male golfers in need of a good bed to sleep in and make coffee in the morning before heading out to play golf all day. House was clean, beds comfortable. Not the fanciest house in town, but priced accordingly. Would stay again next year. Nice home, very easy to book the home. Thanks. Drains in the patio seemed to be clogged. Maybe one more sharp knife. Instructions for maintenance of the home, internet connection, etc. otherwise, very comfortable home in a great location. 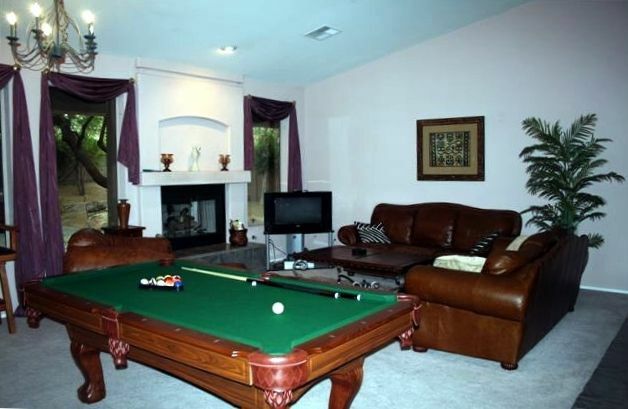 We all loved this property great location close to Westworld and dining I will definitely book this property again. sharp knife in the drawer and it was a paring knife. There were no instructions for such things as recycling or check out procedures. But the most disturbing failure was the the hot tub. It was not functional at all when we arrived. We found it dirty, cold, and not operational, nothing like photos in the listing. It took multiple calls and 2 days of lost use time before it was repaired with no offer of any compensation or reimbursement for the inconvenience. Nice house and a great location, however it was advertised as a 4 bedroom but the 4th was a den with a sleeper sofa that was not acceptable for 4 older guys with old backs. Fortunately one bedroom had twin beds so we all had a place to sleep. Came for a guys golf trip and House was very nice. For monthly rentals, refundable $500 security deposit will be processed and refundable 10-14 days after guest vacate premise. Monthly rates exclude utilities which are billed at actual cost, depending on how much you use. Rates are subject to change until reservation is confirmed. Under no circumstances will we ever ask our guests or inquirers to wire money to our bank. Please do not send money through wire transfers or write personal checks. Thank you!